Are you ready for digital manufacturing transformation? Does your organization have the necessary institutional support to begin your Digital journey? Do you have the right IT infrastructure in place to be successful? 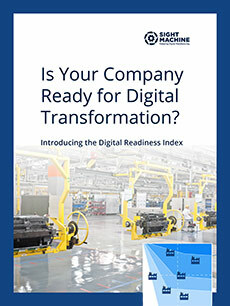 Introducing the Digital Readiness Index (DRI) white paper. Through our work with G500 manufacturers, Sight Machine has determined the success factors critical for digital transformation. DRI identifies which key technical and organizational assets you have in place to start your digital journey. The answers give you a roadmap for prioritizing plants, building capabilities, and benchmarking against peers. Is your company ready for digital transformation? Learn how to use the DRI self-assessment tool to evaluate your organizational and technical readiness. Do you have the commitment, budget and staffing? Do you have the data infrastructure and knowledge infrastructure? Evaluate which plants are most likely to succeed.